Hey Love: Style Spotlight!! The White Tee!! Style Spotlight!! The White Tee!! Hola babies! Welcome to a new week! I'm obsessed with a good white tee! There are just so many styling possibilities and looks that can be imagined just using a simple staple. From skirts to patterns---a white tee can always be the go to! 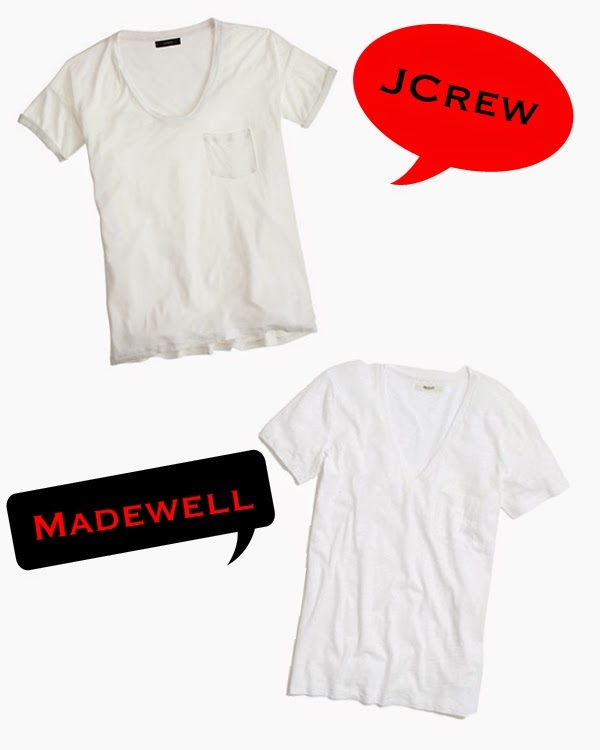 Check out my inspo below and two of my favorite tees from JCrew and Madewell! A white tee is perfect! I love to dress them up. I recently got a white v-neck! love these style inspirations. a plain white t-shirt is a must! You can't go wrong with a classic white tee! Love the pic of Miranda Kerr especially. I agree, it can be great but it can be done so wrong! I just love a good white tee! Could you check out my blog and follow it on bloglovin? I will follow you back! Simple white tee like this is a must have, I agree! BIG fan of the white tee! These really have been popping up everywhere lately! I need to upgrade mine! I agree, a good white tee is essential! Love them :). Great post... I love plain white tees! I just remember that I need to get me a couple of nice white t-shirts. The ones you suggested look great. Girl it is all about the white tee! Do you ever like to do a little DIY? It's always so much fun to see what you can do with the tees. I love double denim and white tees too! I LOVE a great white tee - that first pic of Ashley or MK is so classic - I think every girl wants to have an amazing photo like that!